Come in and experience a [n]8 Touch massage for a low introductory price of only $49.99 for a relaxation massage (First-time clients only). You Deserve an [n8] Touch Membership Today! 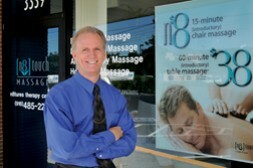 You pay a low monthly price of $49.99 and receive one 50-minute relaxation massage monthly. Receive unlimited additional massage sessions at the low membership rate of only $49.99 per relaxation massage. As a member you also receive free aromatherapy with your massage if desired. Ask about our Family Discount Card! These cards can be used by any family member for massages.